Download the printable version of this polo mallet repair guide. Virtually any broken shaft can be successfully repaired by gluing a short fiber glass sleeve about 45 mm either side of the break. 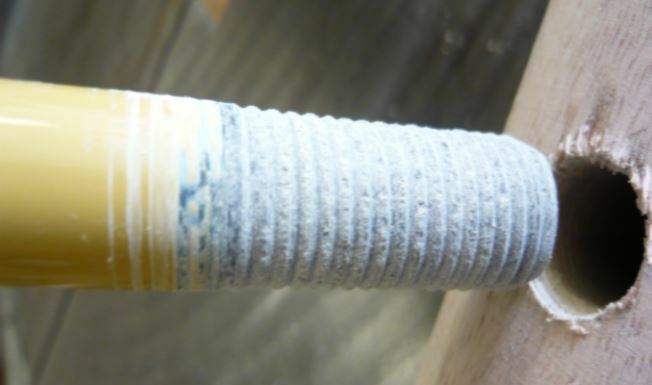 Alternatively a length of good quality cane can be used as for the Hybrid mallet described opposite. We supply two sizes of pre threaded sleeves with either 10.5 mm or 12.00 mm internal holes which will generally repair most shafts. Breaks about half way are very rare and not so easily undertaken. It’s critical to ensure a good fit either side of the break. In most cases this can be done simply with a sharp file although we often use an adjustable die. A little patience is all that’s required to achieve a good fit. When each end fits tightly into the sleeve so that they meet in the middle, a liberal amount of epoxy glue may be applied to all internal surfaces and the joints can then be twisted back together. At this stage the head can be re-aligned with the handle and then left to set. Check that the shaft is set straight and adjust if necessary. When dry, the sleeve may be filed off at the edges and repainted if desired. The Hybrid mallet is an exciting new development where a length of cane is fitted to the lower section of the Fibercane shaft. The concept is very simple. 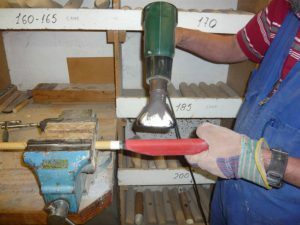 A 10 mm hole is drilled up to 75mm (3″) into the end of a good quality 16/17 mm diameter cane and glued with epoxy. The length of cane can vary but up to 22″ works well. A couple of wraps of filament tape eliminates any splitting. 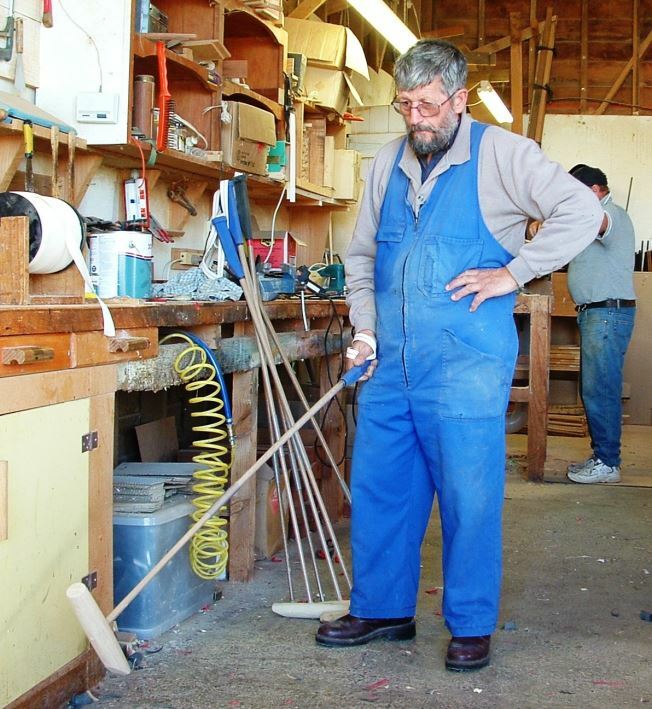 The cane can then be bound with cotton tape and a head fitted exactly in the same way a traditional mallet would be repaired. 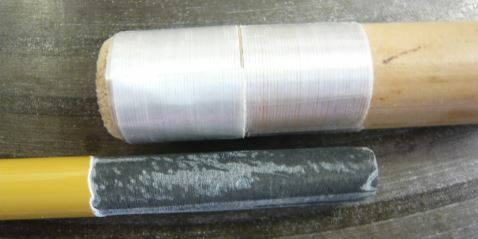 The result, a lightweight and consistent shaft that feels like cane. For Fibercane mallets with broken lower shafts this is a very viable option for repairs. Unwrap the plastic tape at the top of the clear plastic sheath above the head and pull it up the shaft away from the head. Saw the old head off either side of the shaft. Break away the remaining pieces of the old head by using a cleaver into the end grain, being careful not to damage the shaft. Any remaining pieces of wood or glue may now be filed flush with the thread. Although not absolutely necessary, threading the shaft with a die ensures maximum surface area for adhesion to the threaded hole. In most cases, the existing thread will just need cleaning out with a sharp file. To thread a shaft from scratch, clamp the shaft between two V’s in a vice. (A large tap wrench can also be ideal) It’s very important not to weaken the shaft by threading too deeply. Either a 14 mm or 9/16” is usually ideal. (Imperial dies have a wider thread and are therefore more suitable. Thread no further than 38 mm from the end. 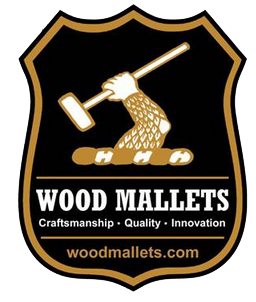 A replacement head from Wood Mallets should have a 12 mm hole with a 14 mm thread. Try screwing the head on bearing in mind that the glue will act a lubricant next time around. If it is too tight, adjust by filing. The end of the shaft should just fit through the bottom of the hole. When you’re satisfied that you have a good fit, apply some high strength epoxy glue to the thread and into the hole of the head. Twist on the head to about 5 mm above the threaded section and check the length and adjust if necessary. Wipe off any excess glue and align the head with the handle. ( See section of fitting cane mallet heads) When dry, paint or varnish the heads and customise as required. Knock down the plastic sheath to fit firmly against the top of the head. Apply a wrap or two of plastic tape to keep the plastic sheath in place. The new moulded grips are extremely durable and outlast the traditional style of grip but after considerable use they may need replacing or you may want to fit a smaller or larger handle. The glue we use is standard hot melt adhesive. This is readily available in most parts of the world and is widely used by handymen for quick repair jobs etc. Tools required are a hot melt glue gun and a heat gun (the type used for paint stripping is fine). The secret to replacing a handle is to heat the old handle up with a heat gun so that the black polypropylene part of the handle gets hot enough to soften the adhesive underneath the handle can be twisted off quite easily, it takes a couple of minutes on high heat to get the handle hot enough. BE PATIENT. You need to melt all of the the glue under the handle before it twisting off or you risk breaking the shaft. Tip: if you wrap a layer of electrical or masking tape on the shaft at the base of the handle before removal, mark the center line of the handle onto the tape. This way, it’s easy to align the new handle with the mark and any excess hot melt glue can be peeled off with the tape. Be careful not to break the base of the handle by twisting too severely. If the handle is heated enough it should come off relatively easily. Best to wear some leather gloves or similar before you grab hold of the handle. The new handles are available in two sizes and colors and come ready to glue straight on to the shafts using hot melt glue. A heat gun is also useful at this stage to keep the hot melt glue hot enough, allowing time to fit and align the new handle. Spare moulded handles are available at NZ$15.00 each with slings fitted.There are two sizes, medium and large. The handle replacement procedure normally takes less than 5 minutes. Having a sling adjusted correctly so that it supports your wrist make a huge difference. Often slings are too long and the player has to grip the mallet tightly. If the sling is comfortably firm across the back of the hand it allows the whole weight of the mallet to pivot from your wrist. Our moulded handles allow for the sling to be replaced or adjusted simply by unscrewing the two screws in the knob. 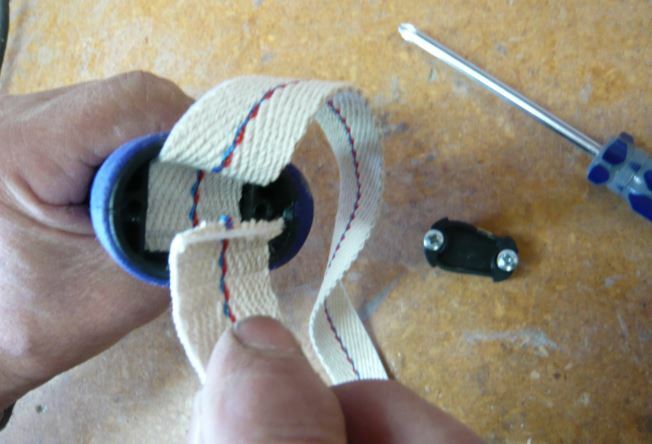 If necessary, trim 1” off the sling and cross the ends over as pictured before replacing the end cap. Make sure you don’t over tighten the screws as this can strip the threads.